Let’s face it, HTML5 video is in its infancy. Precocious as it may be, it still has a lot of growing up to do. This group of very determined and ingenious developers, filmmakers, and journalists is working together to make it easier to mash up Google Maps, image feeds, Twitter accounts and other semantic data to create data-rich video and audio experiences. 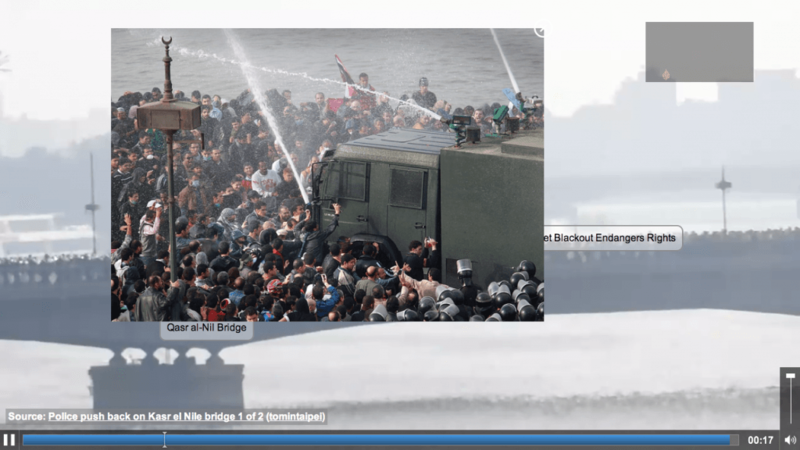 One especially impressive example of this is the #18DaysInEgypt project, which uses annotated and aggregated video, commentary, and news items to build an immersive experience. I expect to see many more amazing data-rich video applications being spawned from this powerful library in the future. Mozilla Dev Derby: Lights, camera, action! This entry was posted in JS Library, Video by Lisa Larson-Kelley on Posted on July 27, 2011 by Lisa Larson-Kelley. Lisa is your guide through the ever-changing landscape of online video. Her clear teaching style, coupled with what has been described as her “encyclopedic knowledge” of web video technology has helped countless people of all skill levels find their way.